I’m just finishing up my first international travel with HOPE, first to Romania, to attend the individual lending spiritual integration conference Matthew wrote about earlier, then on to Ukraine to track down some of our first clients as we prepare to celebrate our 15th anniversary later this year. 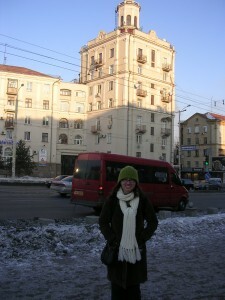 I’ll write more about my actual trip later, but first a short lesson in Russian. I had been surprised to learn that while Ukrainian is the official language and is spoken by 67 percent of the population, Russian is the main language in the east, where I spent much of my time in the city of Zaporozhye. Spasibo: One of the few words I was able to learn ahead of time (along with da [yes], net [no], and do svidaniya [goodbye]), spasibo means thank you and was probably the word I used most often on my trip—whether to my compartment-mate on the overnight train for showing me how to make up the bunk, to people in the marketplace for giving us directions through the maze of stalls, or to clients for taking time from their work to share their stories. Marshrutka: Similar to a small bus, marshrutkas are a common form of public transportation that take you seemingly anywhere in the city for 2.50 hryvnia (about 30 cents). They can get crowded during rush hour, when people cram themselves into the aisle making getting off a feat of contortion, but they were a convenient way to visit clients cheaply. Holodna: Meaning cold, holodna often seemed an understatement. It’s been a particularly chilly month for Ukraine, with temperatures in the single digits Fahrenheit. Yet, when we visited the outdoor markets to speak to clients, they were all hard at work. One client explained that she wouldn’t know what to do with herself if she stayed home all day. And HOPE staff members were hard at work as well: we spent a couple hours one day walking around a rural community passing out fliers advertising agricultural loans, which are a growing part of HOPE Ukraine’s portfolio. and 5. Chai and kofe: These words weren’t too hard to learn, particularly as we were graciously offered tea and coffee everywhere we visited—despite the fact that prices for basic goods like food are very high right now. 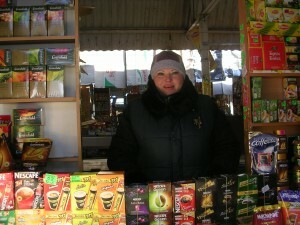 I met one client, Oksana Puchka, who sells chai and kofe in the marketplace and has used her loans from HOPE Ukraine to buy products in bulk. When I asked her how she sets herself apart from the many other vendors in the market, she explained, “It’s very important to know everything about your product, the taste, the smell, the country where the coffee grows.” She then proceeded to recommend a particular type of kofe to us, which I happily bought to bring home. 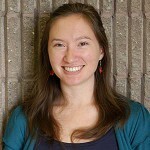 Erin has served as a writer with HOPE since 2009. She loves the dignity with which HOPE shares client stories, and she is always thrilled to travel to the field and hear those stories firsthand. I have some very helpful advice to ease language problems for English speaking travelers planning to travel across Ukraine in the future. There are young people in Ukraine who learn English and know moderate English, and they can be found on language exchange websites where language learners find pals to help each other with language learning through communication (conversation practice) or correspondence. English speaking travelers who do not speak Ukrainian or Russian may mention in their first message to potential pals in Ukraine that they as travelers would like to find Ukrainians with relatively good English to help them communicate in Ukraine. I speak relatively good Ukrainian and can suggest them good aids for English speakers to learn Ukrainian phrases (expressions) and vocabulary for travel purposes. They can also make up potential sentences in English and have them translated into Ukrainian with free translation software or on google.com. Below are some websites to find pals for correspondence. Thanks Michael! Those are some great resources for future travels.